My question is simple. What would people in England in 1700 think of a modern, history loving, 12-14 year old girl? This particular girl was a case of time travel gone wrong. A school trip meant to be observational only and mostly simulational where the travelers aren’t physically there fails and leaves one member of the class stranded. There is no hope of getting back, and she is near the Scottish border. She is wearing a long sleeve red Cotton T-shirt, red leggings, and long green skirt. She is wearing brown leather ankle boots with laces and rubber bottoms. She does not have a phone. She fortunately likes history enough to have some basic skills like sewing, cooking, building things, making things like candles and soap, weaving, etc, without modern tools. She looks like she is from the area, and apart from clothing, would not be too odd if you passed her on the street. How would people of the time and place react to her is she walked into town one random morning. Edit: Farther along the insomnia trail, would it help if she were dubious of the machine and decided to take a few things with her? They couldn’t be to large or expensive, and no computers or cellphones. Size limit around a large satchel with possible wearable items? Edit for clarification: She is from the area in modern times. Not another country or region. How would she be immediately perceived by the citizens of the time? The reason this question is hard to answer is, it depends. Whoever finds this girl first is going to determine her entire future. Let's start off by setting the scene. None of these are cities. I'm guessing they're mostly farming/pastural communities back in 1700. Small towns. Villages really. The Industrial Revolution didn't begin for another few decades. It, along with steam engines, didn't happen until the mid-18th century, when your girl would be middle-aged. Aside from agriculture, fabric was likely the primary industry of the time and region. By 1600 Flemish refugees began weaving cotton cloth in English towns where cottage spinning and weaving of wool and linen was well established; however, they were left alone by the guilds who did not consider cotton a threat...In 1700 and 1721 the British government passed Calico Acts in order to protect the domestic woollen and linen industries from the increasing amounts of cotton fabric imported from India. What does this girl look like to the locals? First of all, maybe she doesn't look like a girl at all. Sure, she's wearing a skirt, but it's not the wide hipped flowing skirt of the late Stuart Period. She has no petticoats or elaborate bodice. 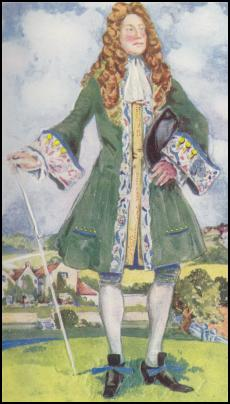 In fact, her outfit looks a lot more like this rich gentleman's. Boots and leggings and all. While no one could mistake her for a boy after a day or two, it's very possible that whoever first encounters her will assume she is a pre-pubescent boy. The higher voice and lack of facial hair would fit right in. As long as her clothes aren't tight and she's closer to 12 than 14, her body wouldn't necessarily mark her as female. This might give her some initial protection and better explain what she's doing in town alone. Everyone knows she's not local because the town is small enough that the residents all know each other. The most likely explanation is that she is a salesperson traveling from town to town to sell her (his) wares. She could even tell people her father is camping in the woods and sent her to drum up business. Or she could be looking for work. Ideally, she'll find an adult she can trust who will take her in for a few days until she can get settled. Those first few minutes will make all the difference. Despite her soft hands, good skin (not much work in the sun), and excellent teeth and health, she will not be mistaken for a noble. Her clothes might be devilishly fine weaving (a t-shirt is not something people of that time period could duplicate, despite the fact that they were skilled with cotton) but they were just not fancy in any way. The boots, sure, they're very expensive work, but they're probably scuffed up (teenagers!) and maybe she got them as hand-me-downs from her last employer. She can't even afford petticoats or proper sleeves! No way is she from a wealthy family. Or even merchant class. What could she bring with her? If she somehow knew this could happen and wanted to bring things ease her transition into early 18th century life, what could she fill a satchel with that would be easy to bring on a field trip? Lace was all handmade back then and took a very long time to make. You need tiny crochet hooks (for tatting) or a needle and thread and great skill and practice. 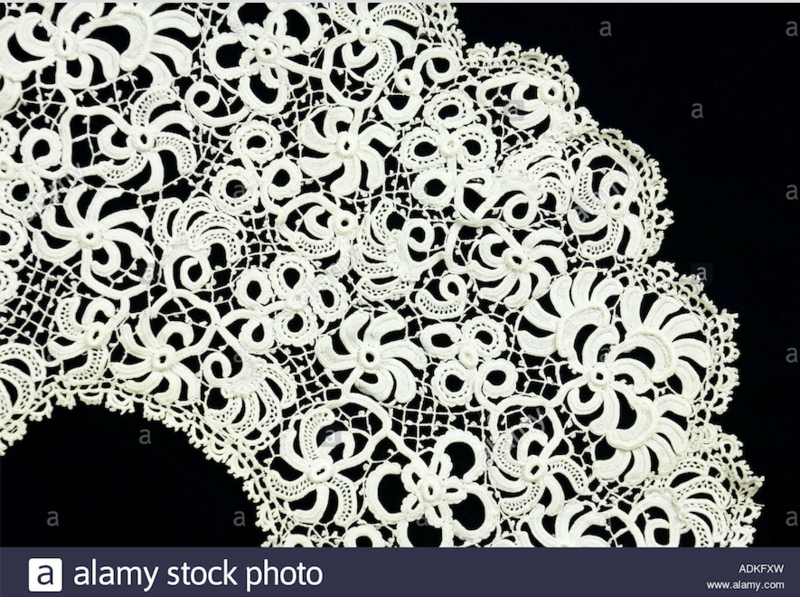 If your character buys pretty machine-made lace.—not the cheapest polyester, but decent quality cotton lace, or lace from synthetics that resemble silk and hold up well—she will be well on her way to having her own business. 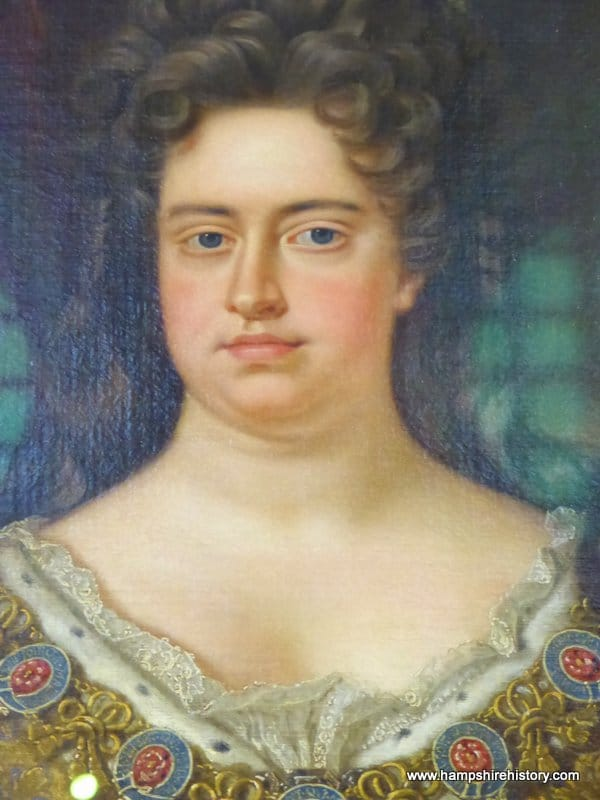 Queen Anne by Closterman 1702. Hanging in Hampton Court Palace. It was quite normal for salespeople to wander the countryside with goods they acquired from others who went on long distant trips to trade. As long as she is not immediately robbed (and in a small town, that's probably not going to happen...towns with that reputation don't get visits from salespeople and that can ruin their economy...towns often had fairs and other events where trade was important). It's your story, if you want her to find kind protective people in the first hour of her stay, then she will. While even plastic jewels would fetch some money, she'd be better off bringing good inexpensive gems made out of glass or less expensive rocks or even some cubic zirconias. Not to pass off as diamonds, emeralds, whatever. But as gems in their own right. She doesn't have to lie: whatever she brings will not be something available there and will be valuable. Paper will not be easy to find and it will not be cheap. A couple spiral notebooks will be very valuable to her. A bunch of pencils will last longer than ballpoints, but both are useful. Names and addresses of nearby barristers (lawyers). This one will take some research but it shouldn't be too hard to look up modern-day firms and find one or two that were founded in or by the early 18th century (she might have to go to London for this, but in 20 years, she'll have the means). Then she can do the old time-travel troupe of leaving a message to be delivered in 2019 to her family. It depends exactly where she turns up and in what country. I'm British so I'll imagine Britain. Initial reactions will be surprise and suspicion. She will almost immediately be labelled a 'foreigner' - probably French which was the default foreigner in those times - because of her funny way of speaking and dressing. Local children will gather round, asking questions and eventually possibly bullying her for her differences. The adults will be curious but not at all trusting. They are used to sameness, and difference will be viewed with extreme suspicion. Poverty is everywhere that she is actually likely to meet people on the street. Upper classes will travel by carriage or horse and not speak to people in the street. To speak to a wealthy person she would have to approach the mansion and knock at the door. The servant who first answered the door would probably just shut it again after telling her to go away. Time-travel simply wouldn't be believed in those days. No-one would want to listen except perhaps she might be considered a good teller of fairy-tales where people can fly through the air and other marvels. The idea of having toilet facilities within the house would be considered disgusting by lower class people and unnecessary by the upper classes who have servants to empty the chamber pots. Perhaps the best place to arrive would be in a farming community. There was always plenty of work to do and hands needed to do it. Workers would likely eat at the large kitchen table and there would be some kind of family atmosphere. The work would be hard and require long hours. When harvesting is impossible because of rain then she would be sent out in the rain to pull weeds. (I know I used to spend the summer on my uncle's farm. You couldn't just sit around doing nothing). There would likely be no pay - just bed and board. In a big city, not having any money or family to call her own, she would be considered an orphan or waif or stray. The orphanages in 18th century England; particularly London were terrible, terrible places for a child of low class. They; most of them situated in ‘Working Homes’ were particularly not even a ‘orphanage’ of any kind. They were simply a workforce with children labour. The nannies, or the masters of the houses were usually cruel, cold-hearted people who beat and forced the child into work. Babies were very rare to survive if given to the ‘orphanage.’ In early 18th century England it was estimated every 12 deaths 11 were infants. If she was very lucky she would be offered a job as a servant with a wealthy land-owner. Even then she would be at the bottom of the pecking order among all the servants and would end up scrubbing floors and taking out chamber pots. 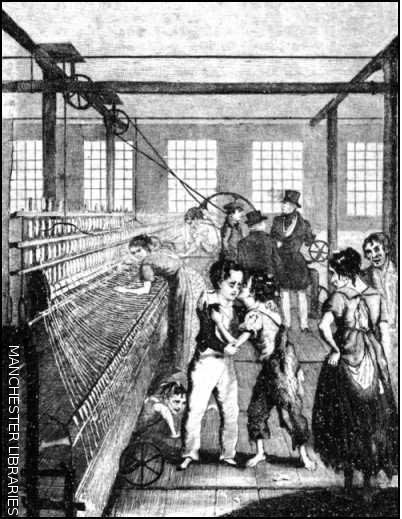 By the later 1700s, if she arrived near a cotton-mill town for example then she would be put to work in fairly inhumane conditions with no health and safety provision and long hours. Even children with relatives had it bad. Consider the case of Jane Eyre. Read the original novel to find out what a terrible time Jane Eyre had whilst young. The local people who encounter her will realize she is a foreigner by her accent. They will realize she is a wealthy foreigner because her hands are soft. She has never done work. Her poor command of English manners will be chalked up to the fact that she is foreign aristocracy. They will be struck by the fact that she is extraordinarily beautiful. She is tall and well nourished. Her hair is clean. Her teeth have been straightened. She has no smallpox scars. Faced with the appearance of a aristocratic foreign young woman, the locals will be extremely respectful and very careful. She will be well treated and as soon as can be done, brought to the local lord. One would think your protagonist needs a cover story but maybe not. She is a terrible liar. She tells the truth. She is from Delaware. She has no idea how she wound up across the Atlantic but if she had to suddenly appear somewhere at least she is still in England. The common people will notice her remarkable clothes and shoes but might be too respectful to ask questions. Once with the aristocracy, there will be someone with a discerning eye who takes notice of her clothes and who is willing to ask questions. She is not a liar. When asked directly, she tells them she is from the future. She is believed and rapidly has an audience with the King. Very intelligent people ask her many, many questions. She develops a fever. She has never been exposed to tuberculosis, until now. If you are placing her in the Marches, then much of the very good stuff already provided will not apply. Even in 1700, the Borders were not well governed. There are few sizeable towns. The Border families still lived in Bastles or strongholds and most people would still be under the control of their feudal lord. What would people in England in 1700 think of a modern, history loving, 12-14 year old girl? A clear skinned young woman, not able to understand Northumbrian or Scots would be soon at risk. Unnaturally clean, strange clothes, unfamiliar with the patois, no money. How does she get herself something to drink? to eat? Can she handle animals? to barter work for food? If it's the cooler 9 months, then she'll be wanting shelter come nightfall - again, how to pay for it? It's hard to travel then, too. 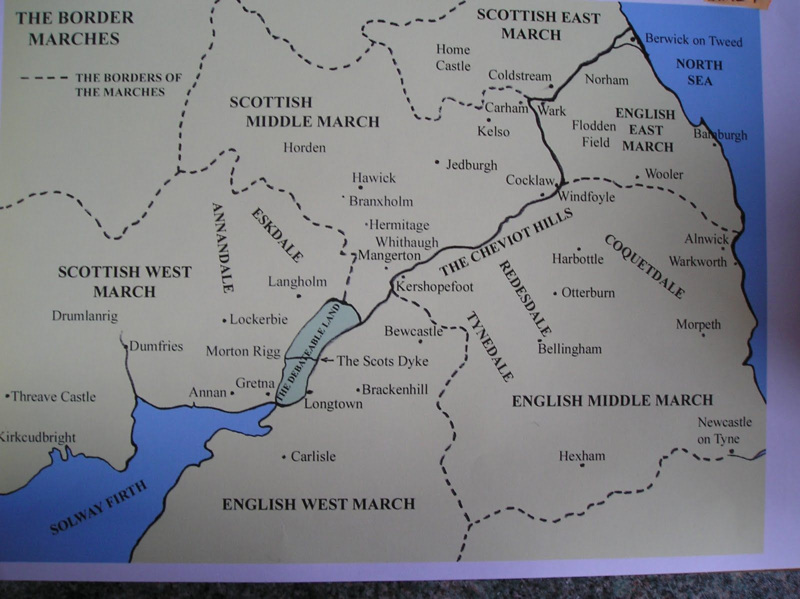 I may be wrong, but you could be before most roads, so the tracks through the dales would be tough to travel, and regularly subject to reivers. How would she know where to go? and in the Cheviots all valleys look alike, so you need a guide. I like the notion though, wish I'd thought of it. You can have plenty of fun developing the scrapes she gets into. I wouldn't be surprised if she got stabbed and robbed there is not exactly very much protection for someone like that unless she got somewhere to stay, she might also be just robbed and shoved into a workhouse. The English spoken in Britain today is not the English spoken in Britain 300 years ago. You need only look at the newspapers of the time to see how people educated at that time speak in "best form" (or "book English"). She'd be hard pressed to understand anybody and everybody would be hard pressed to understand her. Yes, having access to the time period would obviously give her a leg up, but as anyone who's learned a 2nd language will tell you, it's actually really difficult to sound like a native. So, she'd be perceived as a foreigner. Sufferage hadn't happened yet, so she would basically have no rights. Unaccompanied by someone of legal majority, she would be treated as an urchin or of the lowest social class. She would have considerably greater — even vast — knowledge compared to the average citizen of the time. Heck, she'd have vast knowledge compared to the majority of nobles at the time. She might be thought of as a witch. If not, she'd be thought of as a pest, knowing things only men should know and talking in ways only men should talk. The world was very, very, very different back then. She'd suffer something awful from the food. We have an incredibly clean/sterile environment today. All food handling from creation-to-dinner-table is squeeky clean and free of all disease compared to the 1700s. She wouldn't be at all used to the food, the water, the lack of medicines (hope she isn't allergic to anything). Teens are not small adults. Your teenager would be so completely out of her element, so completely unable to judge the motivations, intentions, and actions of people around her that she would be easily used, manipulated, and taken advantage of. (There are wholly scientific reasons why dirty-old-man laws exist....) Bear in mind that professional historians would have trouble "blending in" if they visited the past. Humans are infinitely more complex than can be reported in a book, and history-loving she may be, she's just a teen. She'd stick out (ignoring her clothes) like the proverbial sore thumb. If your teen wasn't dead in a week, she'd be sold off as an indentured servant (at best) to a local land owner or tossed onto a ship bound for Australia or the Americas. However, the fact that no teen would survive this experience with their life or sanity intact hasn't stopped many authors from placing teens into adult situations to save the day. The entire Young Adult book industry depends on everyone's willingness to suspend their disbelief — which is a fancy way of saying you should do a lot of research into the era and location specified, and not worry so much about how the people of that era react to your heroine. Once you get past the language/clothing/behavior hurdles (the first 1% of your story), you get in to the story you actually want to tell, and that's more important. Not the answer you're looking for? Browse other questions tagged time-travel history pre-industrial or ask your own question.